Marlene Dietrich (December 27, 1901 – May 6, 1992) was a German-born American actress, singer, and entertainer. She is regarded as being the first German actress to become successful in Hollywood. Throughout her long career—starting as a cabaret singer, chorus girl, and film actress in 1920s Berlin; Hollywood movie star in the 1930s; World War II frontline troop entertainer during the 1940s; and finally as an international stage show performer from the 1950s to the 1970s—Dietrich constantly re-invented herself and eventually became one of the entertainment icons of the twentieth century. The American Film Institute ranked Dietrich No. 9 among the Greatest Female Stars of All Time. Marlene Dietrich was born Marie Magdalene Dietrich on December 27, 1901, in Schöneberg, a district of Berlin, Germany. She was the youngest of two daughters (her sister Elisabeth was a year older) born to Louis Erich Otto Dietrich and Wilhelmina Elisabeth Josephine Dietrich (née Felsing). Dietrich's mother was from a well-to-do Berlin family who owned a clock-making firm, and her father was a police lieutenant. Her father died in 1907, whereupon her mother took a job as housekeeper for Eduard von Losch, a first lieutenant in the grenadiers. Wilhelmina Dietrich married von Losch around 1916, but he died soon after as a result of injuries sustained during World War I. Von Losch had never officially adopted the Dietrich children, hence, Dietrich's surname was never von Losch, as is sometimes claimed. She was nicknamed "Lene" (pronounced Lay-neh) within the family. Around the age of 11, she contracted her two first names to form the then-unusual name, Marlene. Dietrich attended the Auguste Victoria School for Girls from 1906-1918. She studied the violin and became interested in theater and poetry as a teenager. Her dreams of becoming a concert violinist were cut short when she injured her wrist. In 1921, Dietrich auditioned unsuccessfully for theatrical director and impressario at Max Reinhardt's drama academy. However, she was able to find work in his theaters as a chorus girl and playing small roles in dramas, without attracting any special attention at first. She made her film debut playing a bit part in the 1922 film, So sind die Männer. She met her future husband, Rudolf Sieber, on the set of another film made that year, Tragödie der Liebe. Dietrich and Sieber were married in May 1923. Her only child, daughter Maria Elisabeth Sieber, was born in 1924. Dietrich continued to work on stage and in film both in Berlin and Vienna throughout the 1920s. On stage, she had roles of varying importance in Frank Wedekind's Pandora's Box, William Shakespeare's The Taming of the Shrew and A Midsummer Night's Dream, as well as George Bernard Shaw's Back to Methuselah and Misalliance. It was in musicals and revues, such as Broadway, Es Liegt in der Luft, and Zwei Krawatten, however, that she attracted most attention. By the late 1920s, she was also playing sizable parts on screen—the most notable films being Café Electric (1927), Ich küsse Ihre Hand, Madame (1928), and Das Schiff der verlorenen Menschen (1929). In 1929, though, she got the breakthrough role of Lola-Lola, a cabaret singer who causes the downfall of a hitherto respected schoolmaster, in UFA's production, Der blaue Engel, known in English as The Blue Angel (1930). The film was directed by Josef von Sternberg, who thereafter took credit for having "discovered" Dietrich. The film is also noteworthy for having introduced Dietrich's signature song "Falling in Love Again." Screenland, April 1932, Marlene Dietrich on the cover of the American movie magazine. On the strength of The Blue Angel's success, and with encouragement and promotion from von Sternberg, who was already established in Hollywood, Dietrich then moved to the U.S. on contract to Paramount. The studio sought to market Dietrich as a German answer to MGM's Swedish sensation Greta Garbo. Her first American film, Morocco, directed by von Sternberg, earned Dietrich her only Oscar nomination. Dietrich's most lasting contribution to film history was as the star of a series of six films directed by von Sternberg at Paramount between 1930 and 1935: Morocco, Dishonored, Shanghai Express, Blonde Venus, The Scarlet Empress, and The Devil is a Woman. Von Sternberg had seen potential in Dietrich that other German directors had missed (and which, even in retrospect, is not necessarily obvious even in The Blue Angel). In Hollywood he worked very effectively with Dietrich to create the image of a glamorous femme fatale. He encouraged her to lose weight and coached her intensively as an actress. She, in turn, was willing to trust him and follow his sometimes imperious direction in a way that a number of other performers resisted. A crucial part of the overall effect was created by von Sternberg's exceptional skill in lighting and photographing Dietrich to optimum effect—the use of light and shadow, including the impact of light passed through a veil or slatted blinds (as for example in Shanghai Express)—which, when combined with scrupulous attention to all aspects of set design and costumes, make this series of films among the most visually stylish in cinema history. Critics still debate vigorously how much of the credit belonged to von Sternberg and how much to Dietrich, but most would agree that neither consistently reached such heights again after Paramount fired von Sternberg and the two ceased to work together. Without von Sternberg, Dietrich, by 1939, was being labeled "box office poison" after her 1937 Korda film, Knight Without Armour, proved an expensive flop. In 1939, however, her stardom was revived when she played the cowboy saloon girl Frenchie in the light-hearted western Destry Rides Again opposite James Stewart. The movie also introduced another favorite song, "See what the boys in the back room will have." She played a similar role in 1942, with John Wayne in The Spoilers. While she arguably never fully regained her former screen glory, she continued performing in the movies, including appearances for such distinguished directors as Billy Wilder, Alfred Hitchcock, and Orson Welles, in successful films that included A Foreign Affair, Witness for the Prosecution, Touch of Evil, Judgment at Nuremberg, and Stage Fright. In 1937, while her film career stalled in Hollywood, she made a film in London for producer Alexander Korda. In later interviews, she reported that, while in London to film Knight Without Armour (1937), she was approached by representatives of the Nazi Party to return to Germany, but turned them down flat. Dietrich became an American citizen in 1939. In 1941, the U.S. entered World War II and Dietrich became one of the first celebrities to raise war bonds. She entertained troops on the front lines in a USO revue that included future TV pioneer Danny Thomas as her opening act. Dietrich was known to have strong political convictions and the mind to speak them. Like many Weimar era German entertainers, she was a staunch anti-Nazi who despised anti-Semitism. She recorded a number of anti-Nazi records in German for the OSS, including "Lili Marlene." She also played the musical saw to entertain troops. She sang for the Allied troops on the front lines in Algiers, France and into Germany with Generals James M. Gavin and George S. Patton. When asked why she had done this, in spite of the obvious danger of being within a few kilometers of German lines, she replied, aus Anstand—"it was the decent thing to do." Dietrich was awarded the Medal of Freedom by the U.S. Government for her war work. She was also made a chevalier (later commandeur) of the Légion d'Honneur by the French government. Dietrich had a smoky and world-weary singing voice which she used to great effect in many of her films, on records, and later during her world-wide concert tours. Kenneth Tynan called her voice her "third dimension." Ernest Hemingway thought that "if she had nothing more than her voice, she could break your heart with it." Dietrich’s recording career spanned over half a century. Prior to international stardom, she recorded a duet, "Wenn die Beste Freundin," with Margo Lion. This song, with its lesbian overtones, was a hit in Berlin in 1928. In 1930, she recorded English and German-language selections from her film, Der blaue Engel, for Electrola in Berlin. It was at this time that she also recorded Frederick Hollander’s "Falling in Love Again" for the first time—it would become her theme song, to be sung in thousands of concerts and forever identified with her—although she is said to have personally hated it. A 1933 Parisian recording session for Polydor produced several classic tracks, including Franz Waxman’s "Allein in Einer Grossen Stadt." She recorded "The Boys in the Back Room" from Destry Rides Again for Decca Records in 1939. In 1945, she recorded her version of "Lili Marleen." Dietrich signed with Columbia Records in the 1950s, with Mitch Miller as her producer. The 1950 LP, Marlene Dietrich Overseas, with Dietrich singing German translations of American songs of the World War II era, was a prestige hit. She also recorded several duets with Rosemary Clooney; these tapped into a younger market and charted. During the 1960s, Dietrich recorded several albums and many singles, mostly with Burt Bacharach at the helm of the orchestra. Dietrich in London, recorded live at the Queen’s Theater in 1964, is an enduring document of Dietrich in concert. In 1972, Dietrich taped a television special, An Evening With Marlene Dietrich—also known as I Wish You Love—at the New London Theater in London: The concert was re-released, with bonus material, as a 75-minute DVD in 2003. In 1978, her performance of the title track from her last film, Just a Gigolo, was issued as a single. She made her last recordings from her Paris apartment in 1987: Spoken introductions to songs for a nostalgia album by Udo Lindenberg. Asked by Maximillian Schell in his documentary Marlene (1984) which of her own recordings were her favorites, she replied that she thought Marlene Singt Berlin-Berlin (1964), an album featuring her singing old Berlin schlager (popular songs), was her best recorded work. From the early 1950s until the mid-1970s, Dietrich worked almost exclusively as a highly-paid cabaret artist, performing live in large theaters in major cities world-wide. In 1953, she was offered a then-staggering $30,000 per week to appear live at the Sahara Hotel in Las Vegas. The show was short, consisting only of a few songs associated with her. Her daring sheer costumes, designed by Jean Louis, attracted a lot of publicity and attention. This engagement was so successful that she was signed to appear at the Cafė de Paris in London the following year, and her Las Vegas contracts were also renewed. It was the start of a new phase in Dietrich's career. When she signed Burt Bacharach as her musical arranger in the mid-1950s, her show started to evolve from a mere nightclub act to a more ambitious one-woman show featuring an array of new material. Her repertoire included songs from her films as well as popular songs of the day. Bacharach's arrangements helped to disguise Dietrich's limited vocal range and allowed her to perform her songs to maximum dramatic effect. Her return to Germany in 1960, for a concert tour elicited a mixed response. Many Germans felt she had betrayed her homeland by her actions during World War II. During her performances at Berlin's Titania Palast theater, protesters chanted, "Marlene Go Home!" On the other hand, Dietrich was warmly welcomed by other Germans, including Berlin mayor Willy Brandt. The tour was an artistic triumph but a financial failure. She also undertook a tour of Israel around the same time, which was well-received; she sang some songs in German during her concerts, including a German version of Pete Seeger's anti-war anthem "Where Have All the Flowers Gone," thus breaking the unofficial taboo against the use of German in Israel. Bacharach left as Dietrich's conductor in 1964. She appeared on Broadway twice (1967 and 1968), winning a special Tony Award for her performance. Her costumes (body-hugging dresses covered with thousands of crystals as well as a swansdown coat), body-sculpting undergarments, careful stage lighting (by Joe Davis) and temporary mini-facelifts helped to preserve Dietrich's glamorous image well into old age. In November 1972, a version of the show she had performed on Broadway was filmed in London. She was paid $250,000 for her cooperation, but Dietrich was unhappy with the result. The show was broadcast in the U.S. and UK in January 1973. Dietrich's show business career largely ended on September 29, 1975, when she broke her leg during a stage performance in Australia. She appeared briefly in the film, Just a Gigolo, in 1979, and wrote and contributed to several books during the 1980s. She spent her last decade mostly bed-ridden in her apartment at no. 12 avenue Montaigne in Paris, during which time she was not seen in public but was a prolific letter-writer and phone-caller. Maximilian Schell persuaded Dietrich to be interviewed for his 1984 documentary Marlene, but she did not appear on screen. She began a close friendship with the biographer David Bret, one of the few people allowed inside her Paris apartment. Bret is thought to have been the last person outside her family that Dietrich spoke to, two days before her death: "I have called to say that I love you, and now I may die." She was in constant contact with her daughter, who came to Paris regularly to check on her. Her husband, Rudolf Sieber, had died of cancer on June 24, 1976. In an interview with the German magazine Der Spiegel in November 2005, her daughter and grandson claim that Marlene Dietrich was politically active during these years. She would keep contact with world leaders by telephone, running up a monthly bill of over US$3,000. Her contacts included Ronald Reagan and Mikhail Gorbachev. Dietrich died peacefully of renal failure on May 6, 1992, at the age of 90 in Paris. A service was conducted at La Madeleine in Paris before 3,500 mourners and a crowd of well-wishers outside. Her body, covered with an American flag, was then returned to Berlin where she was interred at the Städtischer Friedhof III, Berlin-Schöneberg, Stubenrauchstraße 43-45, in Friedenau Cemetery, near her mother's grave and not far away from the house where she was born. Unlike her professional celebrity life, which was carefully crafted and maintained, Dietrich's personal life was kept out of the public view. She married once, to director's assistant Rudolf Sieber, a Roman Catholic who later became a director at Paramount Pictures in France. Her only child, Maria Elisabeth Sieber, was born in Berlin on December 13, 1924. She would later become an actress, primarily working in television, known as Maria Riva. When Maria gave birth to a son in 1948, Dietrich was dubbed "the world's most glamorous grandmother." After Dietrich's death, Riva published a relatively critical memoir of her mother. Marlene Dietrich is reported to have had many affairs, among them with von Sternberg, the director who made her famous, with other actors, among them Brian Aherne, Maurice Chevalier and John Gilbert, the writer Erich-Maria Remarque, the French actor and military hero Jean Gabin, reporter Edward R. Murrow, actor Yul Brynner, Adlai Stevenson, and many others. According to her daughter, she also had some affairs with women, including singer Edith Piaf. Dietrich was known also for the variety of her elaborate costumes, from dresses to mannish suits and tuxedos. Fred Astaire is reported to have said that no one wore a white tuxedo as well as she. On October 24, 1993, the largest portion of her estate was sold to the Stiftung Deutsche Kinemathek—after U.S. institutions showed no interest—where it became the core of the exhibition at the Filmmuseum Berlin. The collection includes: over 3,000 textile items from the 1920s through the 1990s, including film and stage costumes as well as over a thousand items from Dietrich's personal wardrobe; 15,000 photographs, by Cecil Beaton, Horst P. Horst, George Hurrell, Lord Snowdon, Eugene Robert Richee, and Edward Steichen; 300,000 pages of documents, including correspondence with Burt Bacharach, Yul Brynner, Maurice Chevalier, Noel Coward, Jean Gabin, Ernest Hemingway, Karl Lagerfeld, Nancy and Ronald Reagan, Erich Maria Remarque, Josef von Sternberg, Orson Welles, and Billy Wilder; as well as other items such as film posters and sound recordings. The contents of Dietrich's Manhattan apartment, along with other personal effects such as jewelry and items of clothing, were sold by public auction by Sotheby's (Los Angeles) on November 1, 1997. Dietrich never integrated into the Hollywood entertainment industry, being always an outsider for mainstream America. Her German accent gave an extra touch to her performance but made her look "foreign" in the eyes of Americans. Dietrich was a fashion icon to the top designers as well as a screen icon that later stars would follow. She once said, "I dress for myself. Not for the image, not for the public, not for the fashion, not for men." Her public image and some of her movies included strong sexual undertones, including bisexuality. A significant volume of academic literature, especially since 1975, analyzes Dietrich's image, as created by the movie industry, within various theoretical frameworks, including that of psycho-analysis. Emphasis is placed, inter alia, on the "fetishistic" manipulation of the female image. In 1992, a plaque was unveiled at Leberstraße 65 in Berlin-Schöneberg, the site of Dietrich's birth. A stamp bearing her portrait was issued in Germany on August 14, 1997. After some controversy, it was decided not to name a street after Dietrich in Berlin-Schöneberg, her birthplace. Rather, on November 8, 1997, the Marlene-Dietrich-Platz was unveiled in Berlin in her honor. She was made an honorary citizen of Berlin on May 16, 2002. She made several appearances on AFRS shows like The Army Hour and Command Performance during the war years. In 1952, she had her own series on ABC entitled, Cafe Istanbul. During 1953-1954, she starred in 38 episodes of Time for Love on CBS. She recorded 94 short inserts, "Dietrich Talks on Love and Life," for NBC's Monitor in 1958. Dietrich gave many radio interviews worldwide on her concert tours. In 1960, her show at the Tuschinski in Amsterdam was broadcast live on Dutch radio. Her 1962 appearance at the Olympia in Paris was also broadcast. Cirque d' Hiver (Paris, March 1963): Cameo as "Garcon de Piste"
The Magic of Marlene (Melbourne, October 1965): Concert, with orchestra conducted by William Blezard. I Wish You Love (An Evening with Marlene Dietrich) (London, November 1972): Concert TV Special, with orchestra conducted by Stan Freeman. Marlene Dietrich: The Songbook. Hal Leonard Corporation, 1998. ISBN 071197022X. Marlene. Translation by Salvator Attanasio. Grove Press, 1989. ISBN 0802111173. Marlene Dietrich's ABC. Ungar, 1984. ISBN 978-0804461177. Marlene Dietrich: Photographs and Memories. Random House, 2001. ISBN 978-0375405341. Some Facts About Myself. With Gottfried Helnwein. Distributed Art Pub Inc., 1991. ISBN 978-3893222261. ↑ David Thompson, The New Biographical Dictionary of Film (Alfred A. Knopf, 2002, ISBN 978-0375411281). ↑ JFK Library, Ernest Hemingway’s Letters to Actress Marlene Dietrich to be Made Available for the First Time by JFK Library. Retrieved December 6, 2007. ↑ BBC, Dietrich fans scramble to pick up actress's treasures. Retrieved December 6, 2007. ↑ Book Forum, A new volume analyzes Dietrich. Retrieved December 6, 2007. ↑ The German Hollywood Connection, Dietrich's Street. Retrieved December 6, 2007. Bach, Steven. Marlene Dietrich: Life and Legend. William Morrow and Company Inc., 1992. ISBN 0688071198. Bret, David. Marlene Dietrich, My Friend. Robson Books; New Ed edition, 2001. ISBN 1861053193. McLellan, Diana. The Girls : Sappho Goes to Hollywood. St. Martin's Griffin, 2001. ISBN 0312283202. Riva, David J. 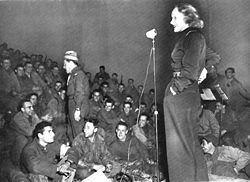 A Woman at War: Marlene Dietrich Remembered. Wayne State University Press, 2006. ISBN 0814332498. Riva, Maria. Marlene Dietrich. Ballantine Books, 1994. ISBN 0345386450. Spoto, Donald. Blue Angel: The Life of Marlene Dietrich. Doubleday, 1992. ISBN 0385425538. Thompson, David. The New Biographical Dictionary of Film. Alfred A. Knopf, 2002. ISBN 978-0375411281. Marlene Dietrich UK Website The Legendary, Lovely Marlene. 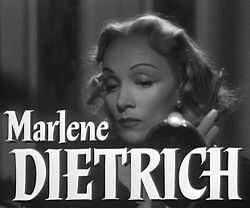 www.marlenedietrich.org.uk. Marlene Dietrich at the Internet Broadway Database. www.ibdb.com. Marlene Dietrich at the Internet Movie Database. www.imdb.com. Marlene Dietrich at the TCM Movie Database. www.tcm.com. ABC Nightline (03/28/07): 'I Want to Kiss You Forever': Romance and Friendship Mix in Rare Dietrich, Hemingway Letters Set for First Public Viewing. www.abcnews.go.com. Photographs of Marlene Dietrich. film.virtual-history.com.